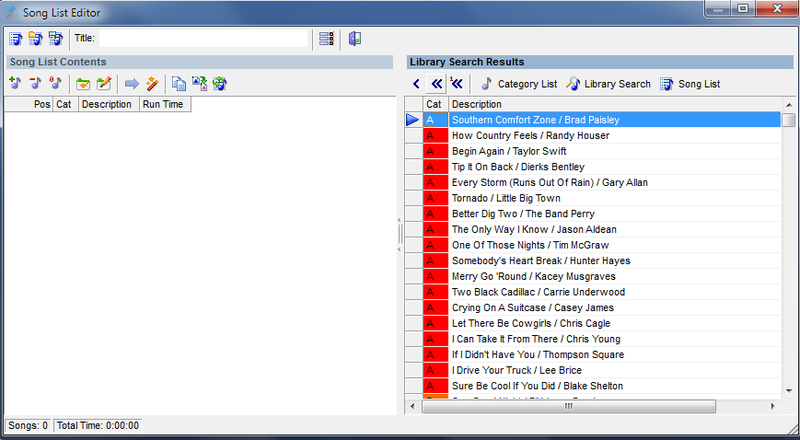 It’s a challenge to keep a radio station’s database in the best shape it should be. Day in and day out, you’re making changes, moving songs around, adjusting rules all to keep the station sounding the best it can. Maintaining a database can be a real challenge and perhaps it’s time to ask for more money. Your job is super important! When you open a database to take a look around, you’ll know with some certainty whether the database is being properly maintained or not. Today, you can compare your data to the seven signs of a dysfunctional database. This is one of the earliest signs that something is wrong in the data. You can also bet that there’s something wrong on the air, too. If your data is incomplete, it’s impossible for your rule tree to maximize your library and generate a good log. If Artist Keywords are missing from songs or if song cards contain incomplete attribute fields, the database is in trouble. Rules aren’t able to test and pass or fail all songs. The spirit and the sound of the station can’t be achieved without complete data so look here first when grading the dysfunction of your database. A Rule Tree can be an antique store or it can be a tech store. Antique stores tend to be full of old junk. Some of it works and some of it doesn’t but it’s all old. A tech store is clean, up to date and with the latest and greatest to offer. How long has it been since you’ve checked out your Rule Tree? What do you sell over there, grandfather clocks or Apple watches? If you’ve scheduled the station with a rule tree that has been tinkered with and touched by former programmers who don’t work there anymore, you’re running an antique shop and it’s time to close down and re-open a Sharper Image. When it comes to Rules, it’s important to know exactly what you sell, what rules you have in place and how they work. Your rules help you create the sound of the station and the mix of music in the log. Knowing exactly how they work and exactly what you have in there is quite possibly the biggest point to take away from this list of seven signs. It’s a FACT: There’s not a rule in the world that will save you from terrible turnovers. If your Power Gold category plays every 12 hours and you’re frustrated that your Shift Rotation rule keeps failing, don’t blame the rule. Blame the turnover. Perfect logs start with perfect turnovers. If you add songs to a category or take a category away from a clock, you’re changing the turnover and it’s one of the most important things to consider when you schedule music. If turnover is bad, the whole database is bad. Remember when we talked about former programmers in your Rule Tree? The same goes for hidden settings in the software. “I had no idea I was Gold Recycling the Recurrents!” “You mean to tell me I’ve been Auto Platooning 50% of my Gold category every Sunday?” Take a look around the software and make sure the right lights have been turned on and the right lights have been turned off. You never know when an AutoMove is causing your unforeseen heartache. Tools, Options, Additional Properties is another good place to look. Hidden settings that other users have placed on the data can cause you to pull your hair out if you have no idea they’re being used. Speak to a Music Scheduling Consultant who can take you on a tour of the software to make sure it’s nice and tidy. It’s great to keep copies of the data so you can test out new scheduling methods or check out a new feature. It can get dangerous when you become confused as to which database is the official data. Delete old data you don’t use and make it a policy never to have more than one other copy of the data that is being actively edited. This will save you from updating the wrong data or worse, deleting the wrong database. Reconciliation is important when scheduling music for two main reasons: you must report to certain agencies and governing bodies with a list of what you played on the air and songs that did not play must get placed back in the stack so they can be played and exposed to your audience. If you don’t reconcile by hand or by automation, it will cause your reports to become inaccurate and songs won’t rotate as they should. Another big sign that you’ve got dysfunctional data are the clocks you have listed in format maintenance and how they look inside. Do you have two hundred clocks listed but you only ever use six? Do you have relic lognotes inside your clocks that reference automation systems you don’t even use anymore? Use the Select functionality in Clocks to select clocks you don’t use anymore and remove them. Hunt out old lognotes and references to old automation systems by using the Lognote, Purge feature. This will only remove those lognotes that are not in any clocks or logs. It will keep your data cleaned up and ready for another change down the line! Can you think of other signs that indicate a database needs some work? Pass it on to us! 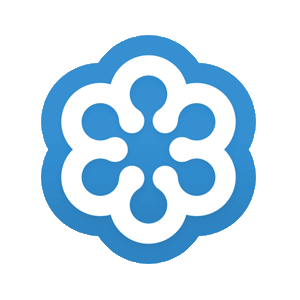 Do you need to speak to someone who can help you clean up your data and get it back in shape? Call your assigned Music Scheduling Consultant for more and happy scheduling! Some days, a client call about one thing and then, it turns into a fact finding mission about a completely different issue. Let’s take the call I received this morning from PD Bob. Initially, he’d called about changing one hour in his assignment grid for just one day. We went through the steps in changing the grid, unscheduling that hour to reset the clock template, and rescheduling the one hour. I was thinking …okay, that was a quick call. Then, he asked how to disable Gold Recycling in a few of his older categories. We discussed it and I walked him through the procedure. (Dataset/Schedule/Gold Recycle/X) Bob also does morning drive, so he is frequently listening to the midday music and then listening to the overnight show the next day, where he’d hear recycled music. We started talking about repetition and listening patterns of the audience. Then, he said something was bothering him about repetition of a specific song and asked about searching by automation number. I pointed him in the right direction using a Library Query, and searched for a specific number. He looked at the history of the song and said he felt like he was going crazy because he thought he heard the song two times within a few hours two or three days earlier. So, I used the MusicMaster “Search Bar”… (it looks like a windows address bar) and searched by the title. That is when we discovered the same title with two distinct automation numbers in active rotation! Since he was brand new to MusicMaster Windows, I suggested we look for more duplicates. 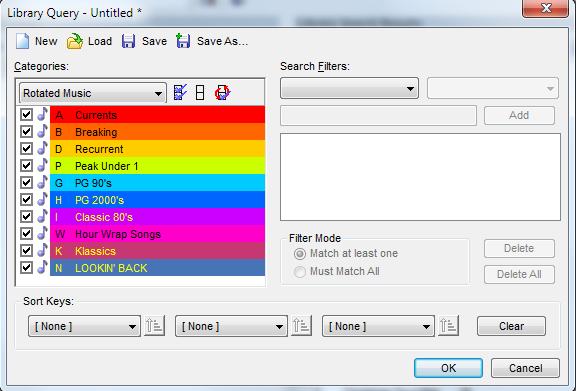 On the left side I showed him the “Wizard Wand” icon and Song List Arrangement function “Find Duplicate Songs”. Once you click OK, the duplicates rise to the top. As you can see, he found four duplicate titles with different automation numbers. So, I had him mark the newer (second song) duplicate with his F7 key, and exit the Song List editor. Now all he needed to do was move the marked songs to a hold category and scan his editor for the marked duplicate songs that were already scheduled, and replace them with something else. Now, is it possible that PD Bob may want to turn his Gold Recycling back on? I’m not sure, but he won’t be having the duplicate issue anymore. Our thanks to PD Bob for allowing us to show his data to illustrate this issue. If you have any concerns or questions about your library and troubleshooting, contact your Music Scheduling Consultant for some quick answers! The majority of calls I receive during any given week, tend to pertain to poor rotations or too many unscheduled positions after running the automatic scheduler. Typically, the results are due to rules that don’t really fit the categories, coding or categories with excessively high minimum rest settings. You may also have rules that conflict with one another. This article is about properly caring for your database. Here is a handy daily “report card” for your MusicMaster database. The Recap Report is a graphic display of how the program did in relation to the rules that you have set up. There are three types of Recap Reports you can view: Rule Stats, Goal Stats and Category Stats. This display gives you detailed information on each rule that was tested. This report is activated when you use Optimum Goal Scheduling. You can sort by any of the column headers that you have. When using Optimum Goals Scheduling, you’ll see one entry for each category where that Goal is used. There are other options to view the Thinking file, Print the Recap Report, or Copy it to a clip board or Word document (as an example). You can view this report immediately after a scheduling run via DATASET-SCHEDULE-RECAP REPORT. You can also make this report open each time following an Automatic Scheduling run by selecting RUN RECAP REPORT AFTER SCHEDULING on the OPTIONS tab of the Automatic Scheduler.